Apple has registered seven unreleased iPad models in the Eurasian Economic Commission database this week, including models A2123, A2124, A2126, A2153, A2154, A2133, and A2152, according to the Indian blog MySmartPrice. 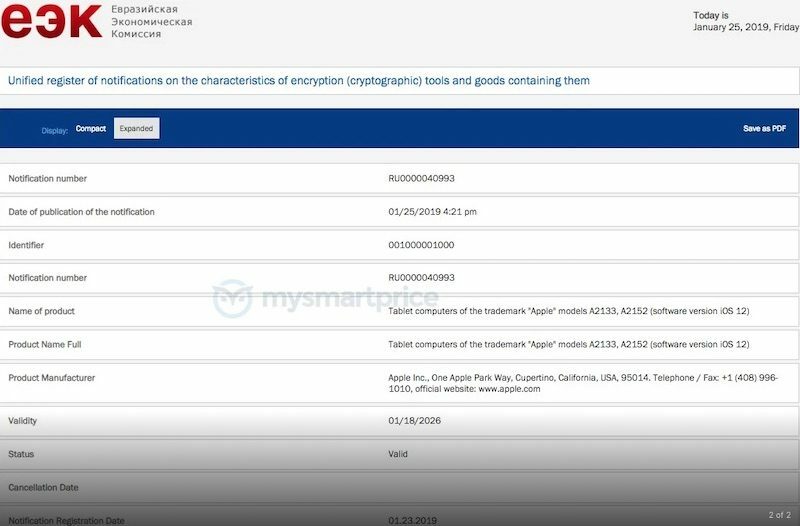 The filings are legally required for any encrypted devices sold in Armenia, Belarus, Kazakhstan, Kyrgyzstan, and Russia. These models could represent new versions of the iPad mini and the 9.7-inch iPad, which may become 10 inches based on recent rumors. Multiple sources have claimed Apple plans to launch a so-called iPad mini 5 and a new entry-level iPad with a 10-inch display, replacing the existing 9.7-inch model, including the China Times and supply chain-focused website DigiTimes. Apple analyst Ming-Chi Kuo also said a new iPad mini is in the works last year. Eurasian Economic Commission filings like these have foreshadowed the release of new Apple products on numerous occasions, including multiple iPad and iPad Pro models, the iPhone 7 and iPhone 7 Plus, Apple Watch Series 2 and Series 4, AirPods, the 2018 MacBook Pro with Touch Bar, and several other devices. March is a common month for both Apple's first event of the year and iPad refreshes, so perhaps we'll see new models then. Notably, Apple hasn't updated the iPad mini since September 2015. Update: A seventh iPad model — A2126 — was also filed in the Eurasian database today. An updated iPad Mini model would be huge. Not that I'm in the market for one, but I know there are a lot of consumers (mainly on here) who want an updated version of the Mini 4. MacRumors, is it not most likely that the new budget iPad will just reuse the old 10.5" Pro chassis, rather than developing a "New" 10" model? Just like the iPad 9.7" is just an iPad Air (1). I just don't see Apple justifying the development cost of a new 10" design when they have the existing molds/parts from the old 10.5. If so, the cheaper 10.5 model could be a very appealing option at the right price point. The hardware as it stands today is fine. No need for new stuff. The Achilles heel of the iPad (& iPhone) is the jump-through-hoops OS. How about some focus on Macs? I hope this rumour of a new mini isn't a massive disappointment. Using my iPhone Xs and then going back to my mini is an eyesore. Updated internals and screen, instant buy. Like I have been saying.. an iPad Mini cellular would be in every Uber in NYC. Please include a mini!please include a mini! "iPad mini is still an important product in our lineup"
They should sell a Mini and an iPad with the same SoC and just let each customer pick the right size. The mythical iPad mini 5 is appearing ! Waited for this ! I actually wouldn't mind one, as a companion to my 12.9 Pro, which can be a bit unwieldy at times.